The Threesomes Cup, sponsored by COLAS ( Isle of Man) Ltd. was played for on Port St Marys Green on Sunday 30th June and attracted a very good entry of 20 teams. The weather was good apart from the odd shower later in the afternoon, which had the effect of slowing the green down. This did not affect the high standard of bowling however. The winners were the team of Juan Hargraves, Mike Hargraves and Ewan Cooil, who beat the team of Bob Clark, Mathew Quirk and Jordain Cain 21-16 in closely contested game. In the semi finals, Hargraves, Hargraves and Cooil, beat the team of Trevor Quayle, Mike Collister and Nathan Cooil 21-7, and in the other semi Clark, Quirk and Cain beat the team of Mark Kneen, John Kennish and Glynn Hargraves 21-15. 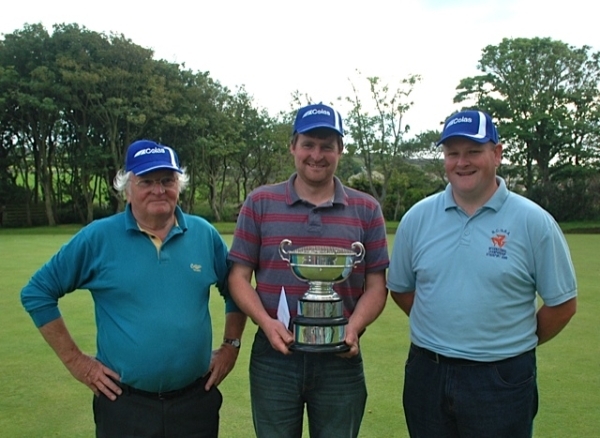 Losing out in the quarter finals were Peter Oates, Andy Clark and Derek Lewney. Ben Dugdale, Tony Dugdale and Steve Cook. Alan Moore, James Teare and George Brew. Paul Leece, Dave Pease and John Ruscoe. The presentation was made at the end of the final by Mr Ian Dunbar, representing the sponsors, Colas. On an overcast, though mainly dry, afternoon there was an entry of 27 ladies competing for the Julia North Cup at Marown on Saturday 29 June. Although the green was heavier than it usually is and caught some of the participants out initially, there were some very close games and bowling of a high calibre. Quarter-finals: Margaret Tasker 21, Rita Callan 13; Maureen Payne 17, Lilian Slinger 21; Jant Monk 21, Rachel Quirk 14; Philippa Fletcher 21, Mary Kinrade 17. Semi-finals: Lilian Slinger 21, Margaret Tasker 17; Janet Monk 21 Philippa Fletcher 17. In the final Janet got off to the better start, taking an early lead at 14-8. Lilian took four of the next five ends to close the gap to just one point at 14-15.The next three ends took Janet to 19 while Lilian retaliated, taking three ends to level to 19-19. In the end Lilian came through to claim the cup 21-20, and was particularly delighted as she had finished runner-up for the previous two years. The presentation was made by Rosie Winckle who thanked all those who had entered the competition and the Marown ladies’ for their help in the smooth running of the afternoon. 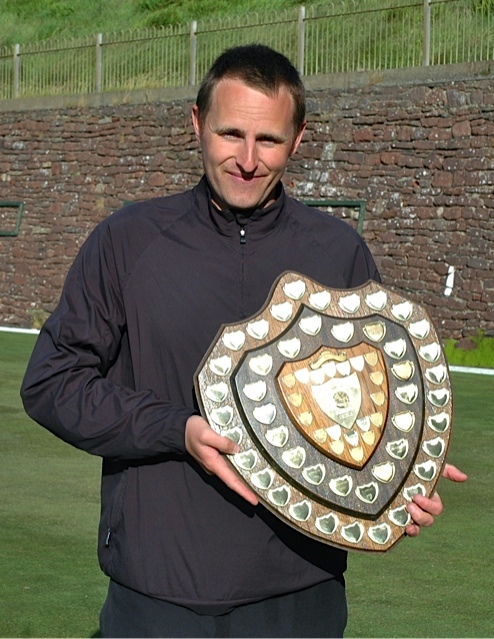 A strong field of 47 irrepressible men made the annual pilgrimage to Peel bowling club to take part in the Summer Shield on Sunday for the last chance to win silverware during the June festival period. The gale-force winds and ever changing weather made the conditions almost unplayable and at times a lottery, but it was Glynn Hargraves (Onchan) who cashed in the winning ticket with a formidable 21-12 final win over David Corkill (South Ramsey). Once Hargraves settled into his rhythm in the final he went about systematically grinding out the victory required to win the coveted shield, and never really let his opponent get into the game. Praise must go to Corkill who handled the treacherous conditions exceptionally well throughout the afternoon, and non-more so than in his semi-final where he defeated newly crowned festival champion Neil Withers 21-14. Hargraves had a battle on his hands at the same stage where he had just enough to overcome the fierce challenge of wily competitor David Faragher 21-18 to book his final berth. Fallers at the quarter final stage were Kevin Dutchburn, Sid Bolton, Alec Taylor & regular visitor Gerry Buckley. At the conclusion of the competition Mr Davidson of Peel Commissioners presented the prizes. Douglas bowling club celebrated their 125 year anniversary in fine style putting on a magnificent competition to commemorate to occasion. The partnership with Okells is a fitting one as Dr Okell was himself a founder member of the bowling club. It was a fantastic continuation of festival week with a strong entry fighting it out at the Villa Marina, straight after the main event, to earn their place in the last 32 on Saturday and a chance of the £500 first prize, the biggest prize in the local game outside of the actual festival. Onchan player David Bradford played magnificently all day on Saturday and topped this off with a 21-15 final win over teammate Kevin Quirk on the magnificent Villa green. Bradford took control from the off and kept his nose in front to seal a memorable victory, picking up the coveted Ken Williamson trophy in the process for being furthest Manxman in the competition. Quirk too played his part brilliantly, showing his talented children that there is still life in the old dog yet, particularly in the semi-finals where he beat Peter Collister (South Ramsey) 21-8. It is great to see Collister back in the game and playing at such a high level after a long absence from the sport and it is hard to believe that it was 30 years ago that he picked up his own June Festival win. In the other semi-final Bradford had to battle hard to overcome Island Champion Glynn Hargraves (Onchan) 21-19. Bradford held a commanding 19-12 lead before Hargraves dug deep closing the deficit to just one point at 20-19. Bradford held his nerve superbly to finish the game of and book his final berth. Fallers at the quarter final stage were Mike Hargraves (Castletown), Janet Monk (Mooragh Park), Stuart Garrett & Dave ‘Barney’ Kelly (both Douglas). At the conclusion of the competition Douglas Bowling Club president Roy Williams, along with Judith Cussack (Okells) and Denis Williamson presented the prizes. It is fantastic to see clubs trying new things and this event was undoubtedly a success and praise must go to everyone at the club involved and the green keepers who turned out an immaculate playing surface. Thanks must also go to main sponsor Okells Brewery along with Denis Williamson, D L Gellings & Visit IOM who all put up prizes for the event. The wind played a major part at Finch Hill on Sunday 23 June when 12 pairs of ladies gathered to contest the Dorothy Piearce qualifier, the winners of which will represent the island at Wolverhampton in August. Some players coped with the wind better than others leading to few close games during the afternoon an exception being the quarter-final, Ann Gale and Jenny Maddrell against Lin Ruscoe and Paula Firth, which the Noble’s Mixed ladies won 21-19. Semi-finals: Jenny Moore and Shelley Kennish 21, Chris Holland and Elaine Moore 17; Janet Monk and Chris Price 21, Lin Ruscoe and Paula Firth 11. 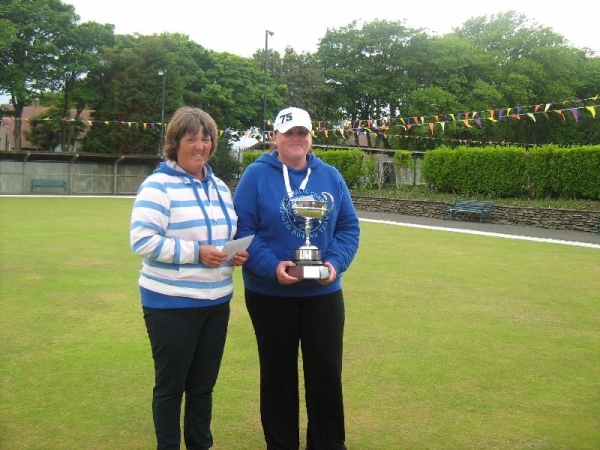 In the final Janet and Chris found a mark along the side of the green which they played well and which their young opponents failed to come to terms with, although they restricted the Mooragh Park pair to a single on several ends. The match was not as one-sided as the score of 21-6 might suggest. The presentation was made by Association president Jenny Maddrell who thanked all those who had helped during the afternoon, particularly Anne Caine who presided over the kitchen providing very welcome hot drinks on a cold day. The rain held off till the latter stages of the ladies’ doubles open played at Noble’s Mixed on Saturday 22 June, and the fine weather contributed to the friendly atmosphere round the green. The 21 pairs provided fine bowling with some very close matches. Semi-finals: Lilian Slinger and Chris Price 21, Philippa Fletcher and Heather Horsburgh 17; Katy Williams and Ann Maddrell 21, Lynda Cadamy and Caroline Whitehead 13. This left two mother/daughter combinations to contest the final. Lilian and Chris had the better of the early exchanges taking a lead of 13-9, before Ann and Katy had a run of 7 ends to give them the advantage 18-13. A 2 on the next end for the Northern pair was followed by the Port St Mary pairing taking the final two ends to win 21-15. The presentation was made by John Ruscoe who thanked all those who had helped during the afternoon, particularly Pat and her crew in the kitchen. Onchan A remained at the summit of Isle of Man Bank Men’s league division one on Monday night after coming back from the brink to tie 5-5 with early pace setters Marown A at the memorial playing fields, and the only question in my mind is how long can they stay there? It is not a question of if, but simply when will they surrender pole position to their closest rivals? Home Captain Neil Withers played his hand magnificently. After assessing the draw he put the four games onto the green that he thought were most likely to result in wins for his team, and after sailing into a 4-0 lead at the half way stage was completely vindicated for his decision. What he could not have allowed for was the fighting spirit in the away sides back order as one by one they mercilessly went about the business breaching the deficit. Glynn Hargraves, David Bradford and Phil Kerruish all put in blistering performances for the champions showing incredible resolve to keep their campaign on track, and with seven of the eight games played they now only trailed 4-3 on the night, with the battle for the two additional aggregate points now swinging in their favour. With only one game left there was all to play for with arguably the strongest players from each side being drawn against each other, in a fight to the finish line. Five times Island Champion Colin Kelly was in no mood to be messed with as he took out double Manx Champion Kevin Quirk 21-16 to add another point to his team’s tally; however whilst not winning the latter man achieved his secondary objective in the process, scoring enough points to ensure his side picked up the two additional aggregate points. You have to give credit to the champions for pulling something out of the bag on this occasion, however I think they are living on borrowed time as I see challengers Marown, who have a game in hand, replacing them at the top of the table in the not too distant future and staying there. I am going to call it early and say the that title will be with Marown at the memorial playing fields in September and the era of Onchan’s dominance will be over. Third placed Douglas A must be absolutely delighted with their 7-3 away win at Castletown A. Both these sides are leading the charge for the minor places and this is definitely first set to the Douglas. Not many teams will leave the crofts with a victory this year so credit should be duly given to the elixir drinking mercenaries. This result nicely sets up a showdown next time out between the high achieving upstarts from the Villa against reigning champions Onchan, and with the encounter taking place on their own turf I honestly think Douglas could get something out of this tie. If they do beat the champions their focus will shift from third place and they will have one eye on second spot. South Ramsey A remain in fifth spot despite unexpectedly losing 6-4 away at Ballaugh A on a tricky green which has recently undergone heave maintenance. The points will be invaluable to the home side as they fight to stay in top tier, however the away side will be gutted to have dropped points on the tricky playing surface. Noble Mixed A moved into sixth spot and have now found themselves some breathing space in the battle for survival after a solid 8-2 win over Peel A at home. North Ramsey B now occupy seventh spot after a 6-4 win over Castletown B saw them leapfrog their opponents up the table. Controversy reigned in division 2 as Castletown D battled hard to defeat league leaders Port St Mary B 7-3, however the town side fielded an ineligible player meaning that they were stripped of that result, which in turn cost them the aggregate points changing the result to a 6-4 win in favour of the visitors who have now extended their lead at the top of the table. Second Placed Port Erin A failed to capitalise on their rivals potential dropped pointes as they went down 7-3 away at Peel B. Third placed Castletown C lost by the same score line away at the ever improving Onchan B meaning that despite losing the town lads are still only two points off a promotion place. Division 3 league leaders Onchan C had to fight hard to beat South Ramsey C 6-4 and remain on track for the title, however challengers Nobles Park A are now only one point adrift after a magnificent 9-1 victory over Port Erin B.
John Kennish got his festival off to winning ways beating Phil Kerruish 21-11 in the final of the Jim Kernan trophy held at South Ramsey bowling club on Saturday. John played exceptionally well all day, and after moving back to his spiritual home this season it is hard to see anyone beating him on his home green, which was in immaculate condition. Kennish was in control of the final from the off and dominated with some exceptional leading which saw his bowls shadow the jack for much of the encounter. Despite not being allowed to get into his stride in the final Kerruish also put in some great performances throughout the day, backing up the fine form he has shown in the league of late. In the semi-finals Kennish put out ex Onchan teammate David Bradford 21-13 whilst Kerruish has to see of the challenge of visitor John Colebourne 21-17. Fallers at the quarterfinal stage were Colin Kelly, Neil Withers, Ian Kissack and Jordan Cain. As development officer for the sport the only thing better for me than the high standard of play was the strong entry of 49 players made up prominently with new faces on the Island scene, and it is great to see new player putting themselves out there and getting into the open scene. 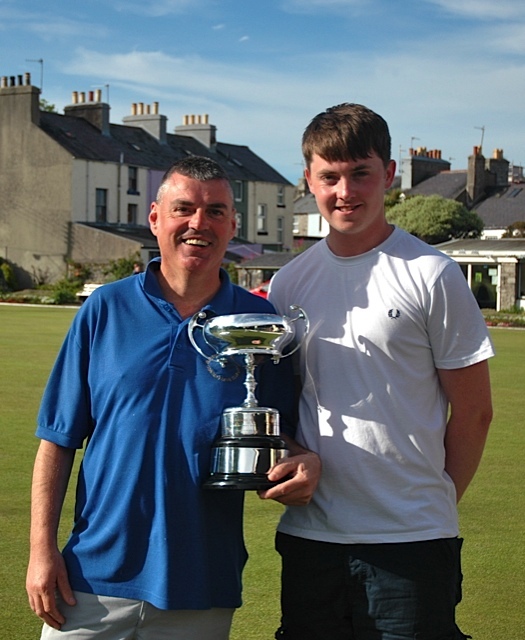 A bumper entry of 80 players converged on Castletown’s superb bowling surface to battle it out for Sunday’s annual Ballacashtal Cup competition which, together with South Ramsey’s Kernan Trophy, always heralds the start of the June Bowling Festival week for the male competitors. Some magnificent bowling was shown throughout the day and the following quarter final scores typified many of the day’s tight games. Ian Johnson (Chesterfield) 21, James Wilcox (Crossgates) 18; Mike Hargraves (Castletown) 13, Charlie Roberts (George and Dragon) 21; Dave ‘Barney’ Kelly 20, Aaron (Bob) Clark (Castletown) 21; John Kennish (South Ramsey) 19, Mark Bramhall (Kirkham Cons) 21. The semis were just as exciting with Johnson falling agonisingly close at 20 against Roberts and in doing so he failed to emulate the successes of his father, Arthur, who won the Ballacashtal back in 1977 and again in 1989. Bramhall got off to a good start in his game against the exciting talents of the young home player but Clark was equal to the task and he came back well to beat the fancied Kirkham player to 18. In front of a big – and noisy (for local bowling!) – crowd Bob Clark raced into a brilliant 14-7 lead but then in trying to make a double which could well have sealed the victory he knocked Roberts’ wood in and with edge bowling the George and Dragon man soon pulled himself back to 14-across. The home club captain retaliated and he rallied his supporters by then scoring a double but it was not to be for the 21 year old even though he got back onto his favourite mark as Roberts went on to accept the Cup from the home club’s President, Hilary Kermode, thanks to a 21-18 victory.